Gujarat University Recruitment 2018: Gujarat University recently published recruitment notification for various post. Eligible and interested candidate may apply for Gujarat University Recruitment 2018 on its official website. Candidate are advise to read to all instruction well before apply online. The Gujarat University published recruitment advertisement for various post. University invite young and aspirant candidate to fill various posts. This is a very good opportunity for interested candidate, they don’t miss this chance for getting Government job. Candidate should posses essential qualification they may apply Gujarat University Recruitment 2018. 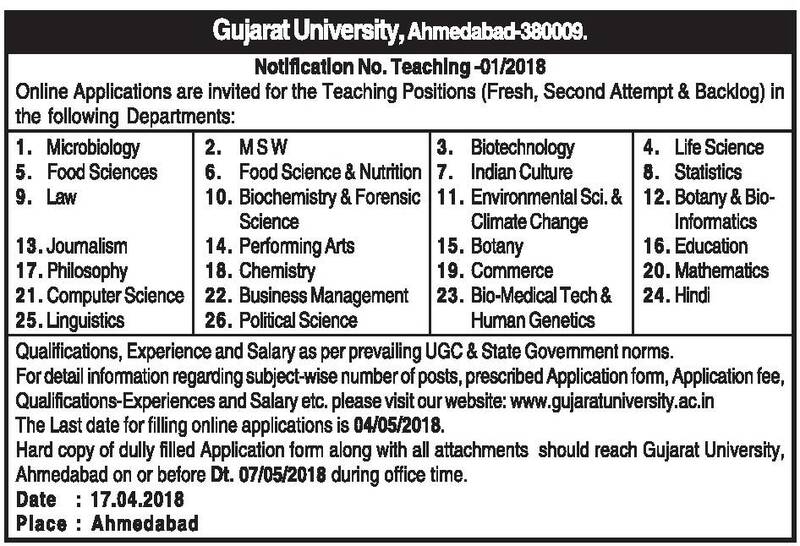 Candidates can apply online for the posts of Gujarat University’s teaching post. Online application close on 4th May, 2018 and hard copy should be submit on or before 7th May, 2018 at Gujarat University office. Qualification, Experience and Salary are as per prevailing UGC & State Government Norms. Candidates are advise to bookmarks this page and be regular touch on this page for get more latest updates about Gujarat University Recruitment 2018.